Blue Evolution is producing two varieties of kelp, alaria and saccharina, in Alaskan waters. Photo courtesy of Blue Evolution. The word aquaculture is a dirty one in Alaska, where finfish farming is firmly prohibited. But if your aquaculture falls within certain limits, permits to proceed can indeed be obtained. Just ask Beau Perry, founder and CEO of Blue Evolution, a San Mateo, Calif.-based company that farms two varieties of kelp, alaria and saccharina, in Alaskan waters. Perry’s main production area is off Kodiak Island, where until recently, two farmers deployed 34,000 feet of line. This year the farmers will more than double their output, to 70,000 feet of line. 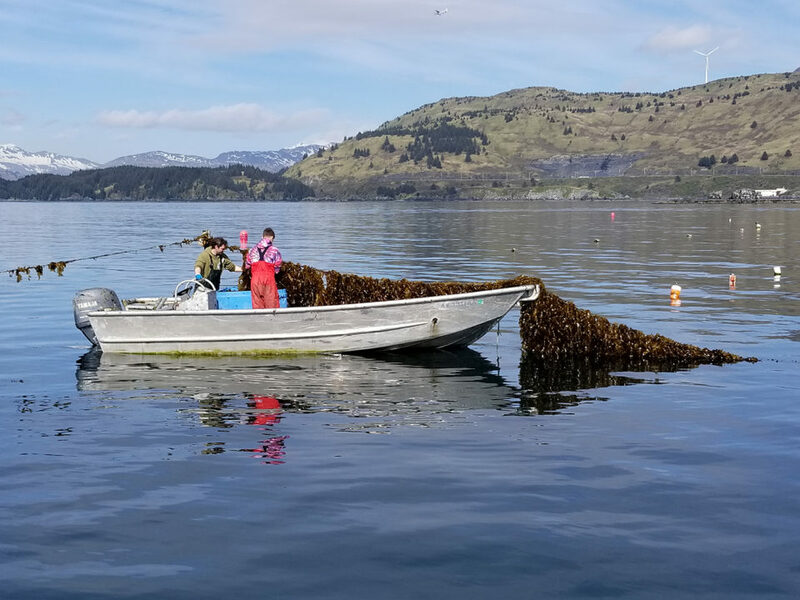 Two years ago, Blue Evolution submitted an application for 34 acres on another site near Kodiak, where Perry hopes to produce a new species of kelp, conduct research and development and train other farmers to grow seaweed. Approval can take anywhere between two and three years, but he’s hopeful a positive answer will be forthcoming in the next few months so that operations can begin this fall. In 2014 NOAA provided grant funds to the Alaska Fisheries Development Foundation to spearhead the Alaska Mariculture Initiative. 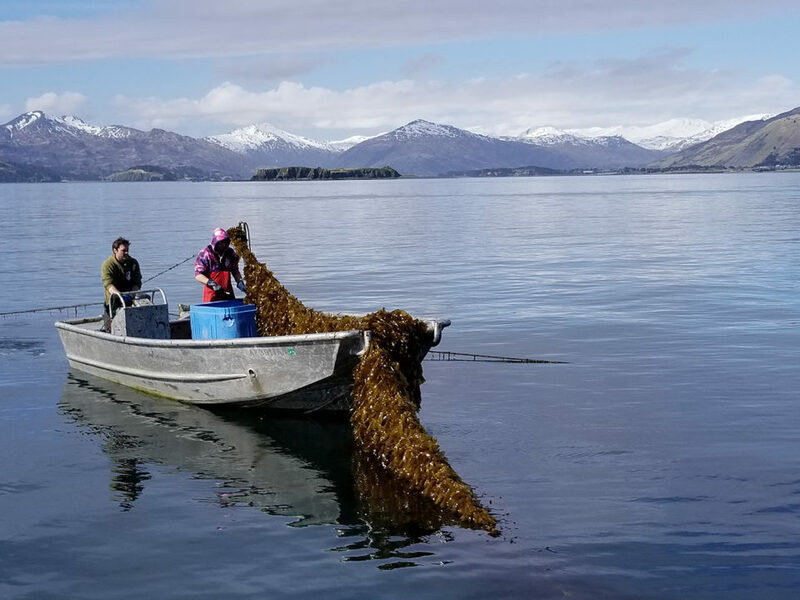 “Mariculture” is Alaska’s term for the enhancement, restoration and farming of shellfish and seaweed, and Julie Decker, AFDF executive director, said it’s important not to confuse the two terms. Producing kelp off of Kodiak Island, Alaska, Blue Evolution aims to grow 200,000 pounds this year. Photo courtesy of Blue Evolution. 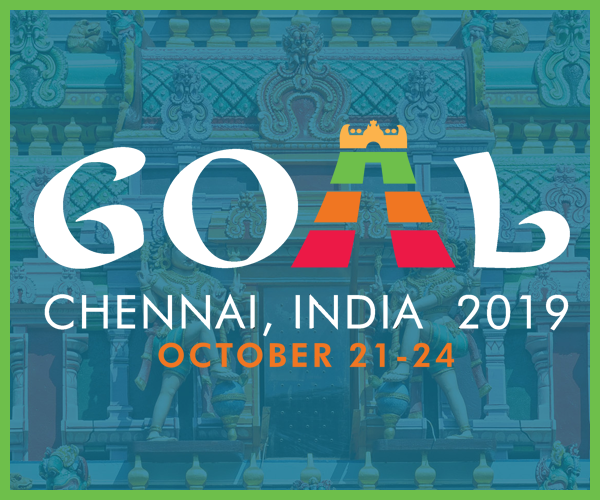 The Mariculture Development Plan, whose 20-year goal is to generate $100 million in overall sales, is hoping seaweed will generate $15.7 million for the industry in the next 20 years. To Perry, this sounds perfectly realistic. The MTF is pinning its hopes on geoducks, mussels, king crab, sea cucumbers and oysters. It says oysters could constitute 40 percent of Alaska’s mariculture industry, which would equate to $30 million. Decker said the total value of species presently being farmed – oysters, blue mussels and seaweed – is $1.5 million. That figure has grown slowly in the past seven years. In 2012 it was valued at $500,000. Another company awaiting permitting from the Alaska Department of Natural Resources is Sitka-based Silver Bay Seafoods, a processor of frozen salmon, herring and squid that applied for a 10-year lease on 182 acres of sea floor near Sitka to start an oyster farm. Tommy Sheridan, external affairs representative for the company, said Silver Bay hopes to have an answer by December 2019, enabling the company to move forward by Spring 2020. The oyster operation would generate 50 full-time year-round positions and would require millions of dollars in capital infrastructure. Additional hatchery facilities may also be required as capacity limits at the existing shellfish hatcheries in Ketchikan and Seward may inhibit the new operation from reaching its full potential. Sheridan said Silver Bay held a couple of meetings to inform the public about their application and answer questions. 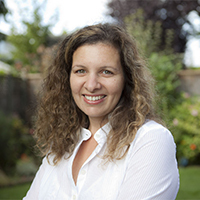 “I wouldn’t characterize the public’s response to our proposed farm as negative – the public was receptive to our answers regarding their interest and concerns. Given the scale of our proposed farm, I believe that such interest is to be expected,” he said. Is public perception of aquaculture – or mariculture – changing in Alaska? Decker believes it is.